We woke up a the Kabiki Hotel (well, I woke up at a 02h30 with a very upset stomach – thanks to the high dining French restaurant from the night before) and after breakfast met our guide and headed out to maximize our single day in Phnom Penh. It was hot when we started off and it was going to get hotter. We started of at the Royal Palace, which unsurprisingly is the complex that houses not only the residences for the king but is where foreign dignitaries often stay, has beautiful gardens and is home to some amazing and unique architecture. With our guide, we were (somehow) allowed to jump ahead of the small queue of people and enter the Palace grounds first. As we walked to our first stop our guide gave us a bit of a history lesson about Cambodia, both ancient and more contemporary. I am a history buff, but I must admit, I had done almost no research on Cambodia and unfortunately my official studies in both High School and College were very limited (read: nonexistent) when it came to Cambodia. 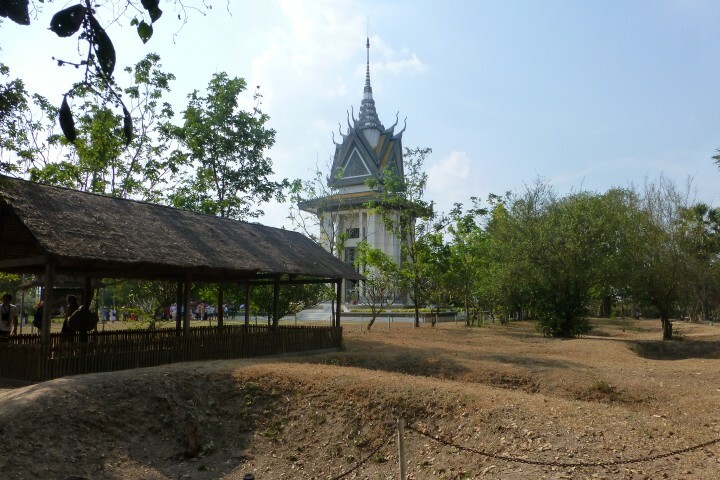 I knew OF the Killing Fields, but didn’t know much about it. For example, I had no idea that Pol Pot decided in 1975 to evacuate all Cities — thus creating a forced agrarian society. Phnom Penh, itself a City of just under 3 million people, was completely evacuated and all residence were turn into farmers in just 3 days. Think of that – a City the size of Chicago now, being completely evacuated in just 3 days. 3 million people – all of Chicago – heading to the fields to become farmers. It is almost unfathomable…and that’s just the beginning. We’ll get back to that in a while though. The grounds at the Royal Palace were pretty empty – then again we were there quite early on a week day not in peak season. Having done very little research on Cambodia before we arrived, I was quite pleasantly shocked to see these buildings. Truly breathtaking, in a totally unexpected turn the corner and WOW sort of way. The top of the Royal Throne Hall is capped with four Buddha faces looking out across the grounds. 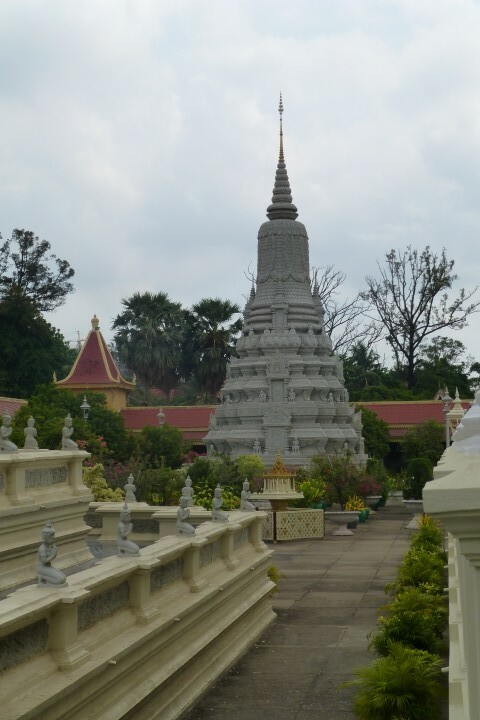 The Silver Pagoda on the grounds houses several national treasures including the Cambodian Jade Buddha, a rare Baccarat Crystal Buddha and a life sized diamond encrusted Buddha. Phnom Penh originally became the capital in 1865 and was called the Pearl of Asia and often considered the one of the most beautiful colonial Cities in French Indochina. The City was originally founded in 1372 and got its name from an old lady (Duan Penh) who found several Buddha statues in a tree floating in the river. 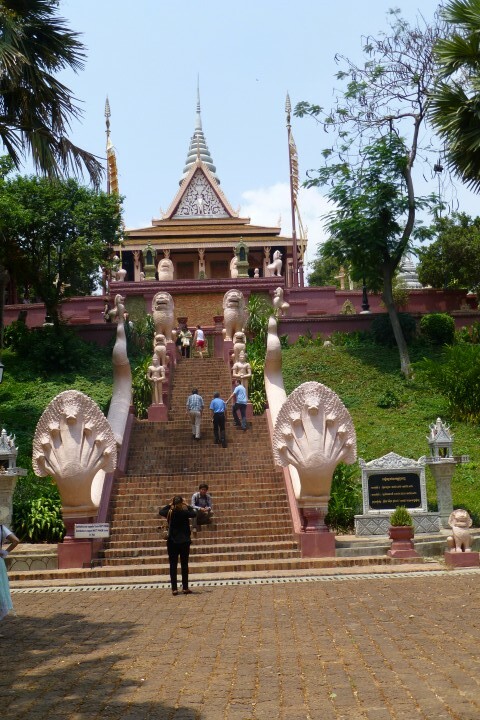 She took these statues and built a small shrine on a hill (Hill = Phnom in Khmer). She believed these statues were sent to her as a sign that the Khmer capital should be moved from Angkor to this area — Phnom Penh or Penh’s Hill. 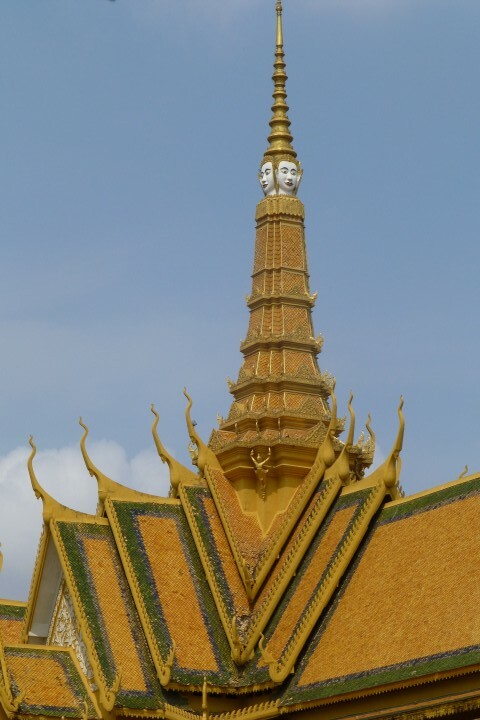 The Wat Phnom – or the Mountain Pagoda atop Penh’s Hill is nearly 27 meters tall making it the tallest religious building in the City. This temple has been rebuild many times throughout it’s lifetime and is definitely worth a visit if you are in the area. I think it is important to visit the founding areas when visiting any City — like the old site of Fort Dearborn in Chicago , see how things have changed over the past few hundreds years. 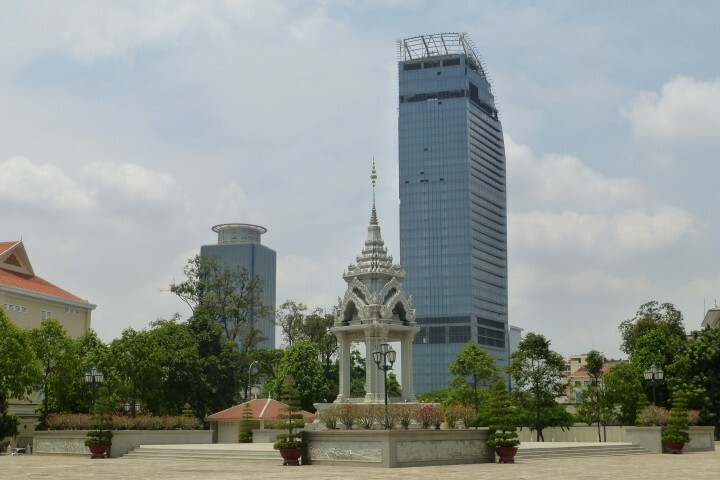 At the base of the Wat Phnom you see a modern sky scraper looming in the background. I just love to see old (ancient) structures intermingled with modern architecture. We hit another market — I will spare you the shots of the flowers, huge hunks of meat hanging in un-air-conditioned spaces and the requisite huge rack of handbags all for sale — none of which were fake (the ladies selling this merch promised us they were real). We then moved on to one of the worst meals of our trip. Our guides took us to a large buffet that had a large mix of locals and tourists. My stomach was still not up to 100% from the prior nights French fare, so I just picked at a Khmer equivalent of spaghetti and meat sauce and slowly sipped my water. 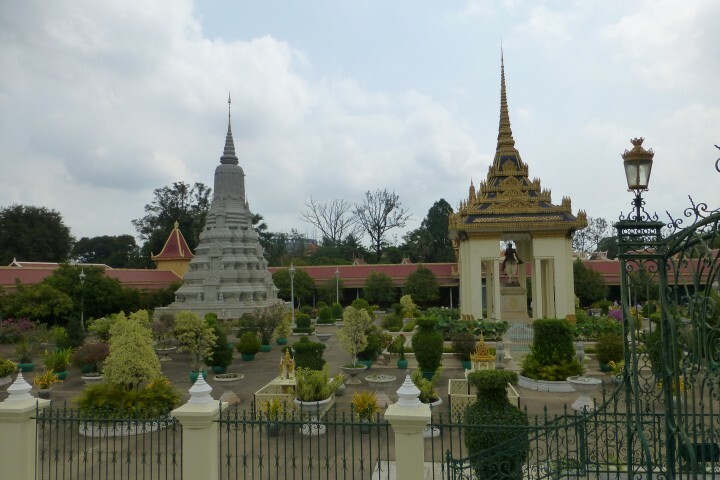 The next stop was really the major point of visiting Phnom Penh – to learn about Pol Pot ant the Killing Fields. Pol Pot took over as the leader of Cambodia in 1975 and almost immediately imposed a forced agrarian socialism on the people of Cambodia. Evacuating the Cities and putting everyone into slave labor camps as farmers. Almost all industrial production stopped. The Cities were empty, save some of the political elite who remained. There were thousands of empty buildings – but unfortunately some were quickly put back to use. 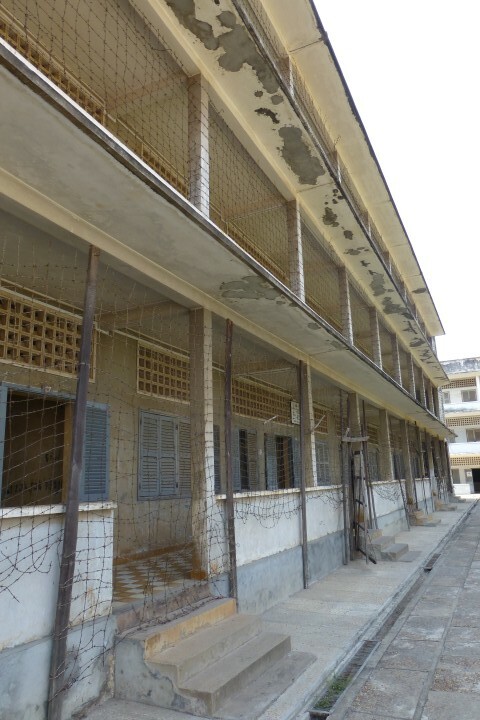 Pol Pot’s forces turned many High Schools into torture facilities. 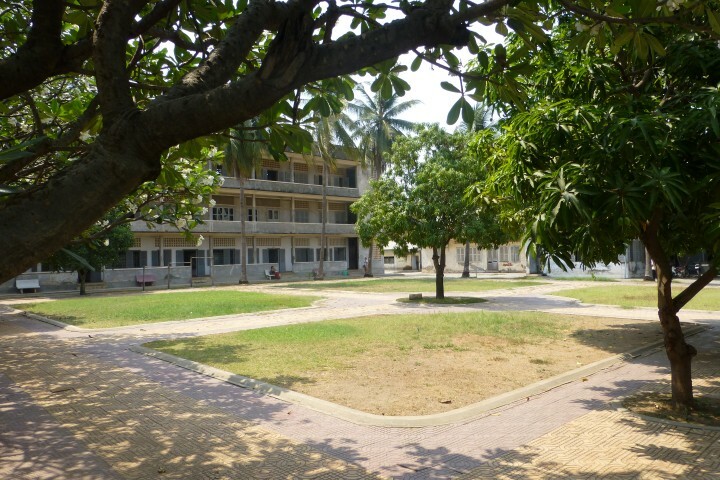 One such facility was subsequently turned into a museum, the Tuol Sleng Genocide Museum. Our guide led us to and through the facility. It was still very eerie to be in this area. You could feel it. You knew it. Something terrible happened here. As we walk around the grounds we heard of the thousands of people who where tortured by the Khmer Rouge. 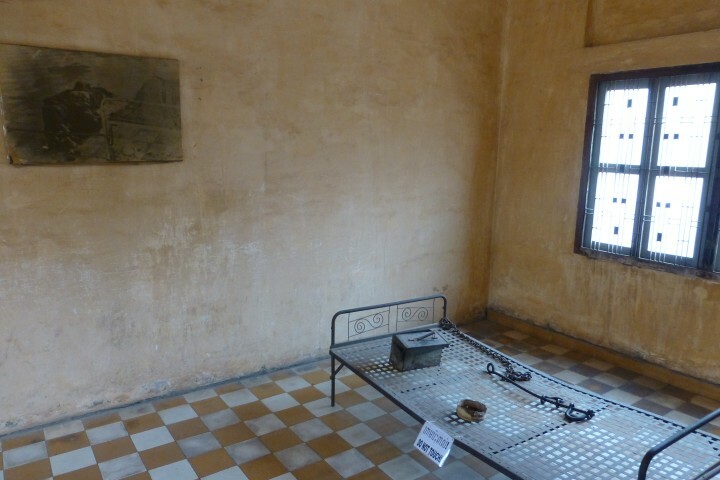 We were shown some of the rooms where the torture had taken place – like below. You see a bed, sans mattress, where a political prisoner would be chained for hours or days at a time. No running water, just a bucket should you need to use the bathroom. This room still had blood stains on the floor and blood splatter on the ceiling. We saw nearly a dozen of these rooms on this tour. On the other side of the museum was larger rooms with photos of people who were kept in this and other facilities around the country. We saw some of the larger prison rooms that were bricked up to make smaller cells for the prisoners. These make shift cells barely provided enough room to turn around, let alone lay down comfortably. This was a place of torture – the Khmer Rouge wanted information and even if you didn’t have any they would torture you for it. The afternoon drew on and we had one final stop before we had to head to the airport again. We needed to visit the Choeung Ek. This was a former fruit orchard about 15km south of Phnom Penh – with traffic it took us nearly 45 minutes to get there, and once arrived we didn’t have much time as we had to get to the airport as part of our group had a flight to Singapore (while our flight to Bangkok left a few hours later). You’ve heard of this site before – maybe not this one specifically, but according to our guide it’s one of the better known and easily accessible from Phnom Penh. Its part of the Killing Fields. During the reign of the Khmer Rouge nearly 3 million people were murders — 3 million out of a total population of nearly 8 million. To dispose of the bodies mass killing sites and mass graves were created. This location has been turned into a museum and while a section of it has been excavated a large portion of it remains intact. 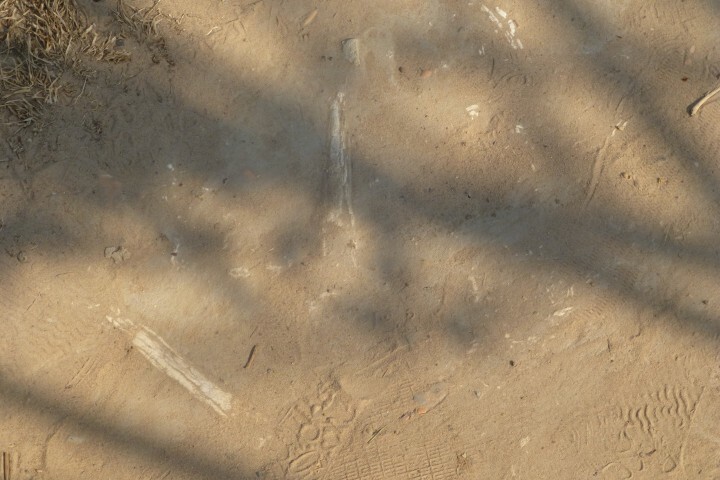 This pagoda below has a base display with hundreds of human bones – everything from femurs to skulls, all taken from the grounds at this former orchard. It was a somber ride back to the airport for us. I really do wish we had some more time to explore Phnom Penh, to see the colonial architecture, to learn more about the role of the French occupation and what happened between the time the capital moved from Angkor to Phnom Penh and the French arrival. Phnom Penh is definitely on my list of Cities in which to return. Phnom Penh was a heavy visit. Our guide was perfectly acceptable – I don’t think I’d use him again on a future visit, but he got the job done. If you are looking for a guide, please let me know — or if you have a guide tell me (or leave contact information in the comments below). Before I close out this post, I want to leave you with something on the lighter side — each time I see a cat on a leash or just hanging out like this one, I feel obligated to take his/her picture. 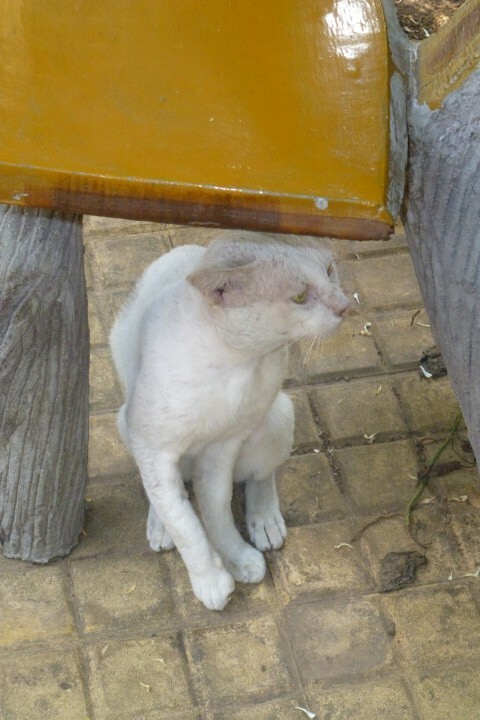 Nice Kitty…. 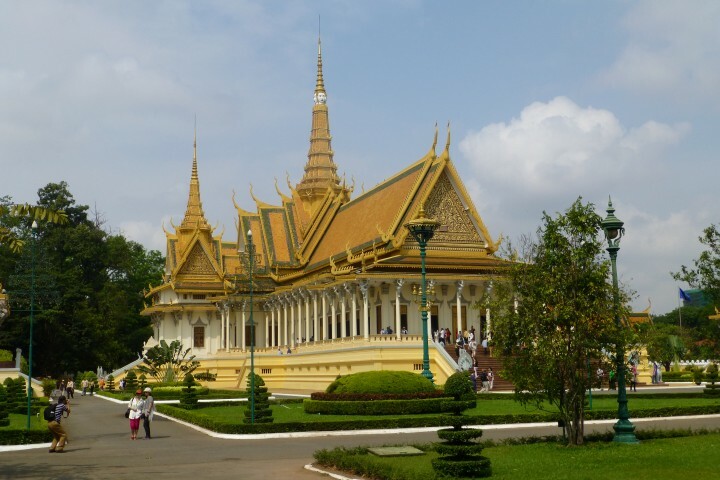 What was your favorite part of Phnom Penh or Cambodia? Do you have a favorite restaurant or a great guide the readers should know about? How many days did you spend in this City? Would you return? By Tim in Travel on January 28, 2014 .